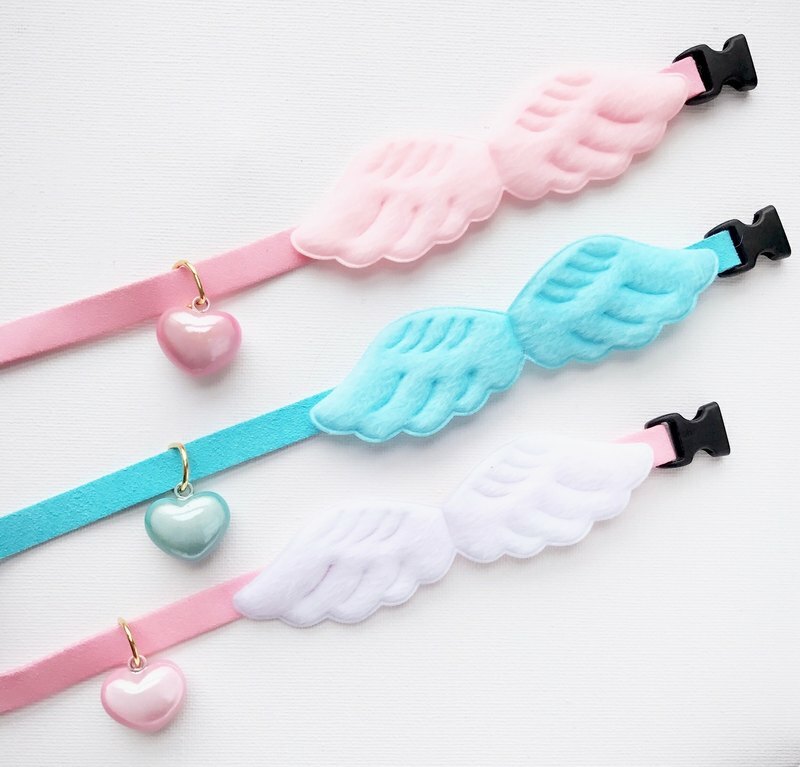 Product: Healing water instrument bell 水琴鈴 fantastic reflective pearl color heart bell love angel handmade pet collar with wings Colour: Pink wings, blue wings, or white wings (With Mint, Blue, Purple or Pink collar) https://farm5.staticflickr.com/4081/35245931930_d37de864e7_z.jpg Material: copper, ribbon, artificial suede leather Type: Pet Collar Bell Size: around 22mm x 22mm heart shape (pink or blue only) Angel Wings Szie: around 11.5-12 cm Collar Size: 20-30cm . Suitable for most kittens & cats (except large and overweight cats), small dogs such as Chihuahuas, Yorkshire, Maltese, etc. Other collar sizes are available on request , we could custom make for you with 7-10 extra working days. https://farm5.staticflickr.com/4521/38453729806_058cf29753_n.jpg The soft suede leather ain't just cute, they are very comfortable. Jojo doesn't like to wear collars but she can wear this for a long time. ❤ The pearl reflective effect is very beautiful in all angles!! But the most special feature of this bell is the imitation sound of the Japanese water caves in temples. The sound is very unique, relaxing and healing.This bell is all sealed and made of pure copper . Usually, you can only find it in Japanese temples, it is a very popular Omamori (amulet) ❤ https://farm5.staticflickr.com/4036/35632620215_22f4f9112d_z.jpg https://youtu.be/Jl3ZTzMC2yE Let's turn your pet into an adorable cupid love angel!! Collars are 100% handmade, so each one is unique and may have slight imperfections . The coating of the bell may fall off if direct contact of the bell with hard objects. Please handle with care and do not wear them in shower or swimming. Handmade in Hong Kong https://farm5.staticflickr.com/4266/34823710583_99326daa27_b.jpg A joyful heart is good medicine. Jojo & Kiki are exotic short hair and long hair cats who bring joy to the family everyday. Jojo is the outgoing and cheerful one , she is the boss in the house. Kiki , who loves toys and treats (but not human)has a very kind heart. They are cute and silly at the same time. They would escape from cleaning and steal small items on the table but they are always the reason we smile :) House of Cats would like to share our joyful moments with you all. Jojo & Kiki are the meowdels of our products. We capture their interesting moments on Instagram and use these photos in our design. We originally created their products for personal used only. Seeing their faces always remind us how blessed and loved we are. We wanted to bring them with us in our daily lives when we work and travel. Each products is well designed and handmade with care. We love each of them and we hope you can feel the happiness of them. We totally agree that each pet is unique and is the best to the owner. We also create marble stardust personalized jewelry and accessories for pet lovers! Follow us on Instagram: jojojoycelam kikikindnesslam Item purchased is made to order . Please allow up to 7-10 days for us to complete your order. Item will be shipped in 48 hours from Hong Kong when it is completed . Delivery Time: USA, Canada & Australia 7-20 business day (holiday season may take a longer time) Asia 2-14business day Free local shipping in Hong Kong All purchased items will be shipped with a tracking code. (except Hong Kong) All items come with a gift packing which is perfect for gift giving :) Please allow for some variation in color as displayed on different devices and screens. Actual colors may vary.